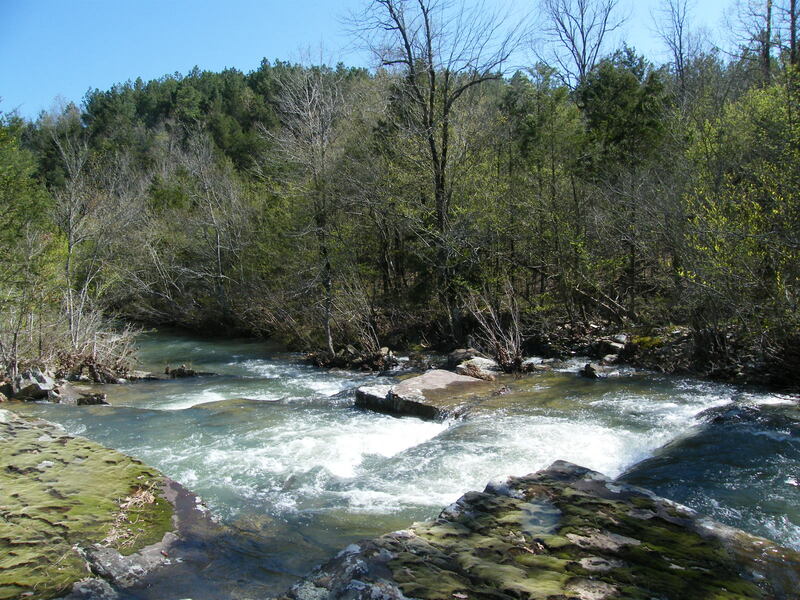 Of the many Arkansas creeks named Little Creek, this Little Creek is located in the Ouachita mountains northwest of Jessieville and drains into the North Fork of the Ouachita River; it’s a Class II – II++ with an average gradient of 68 feet per mile. 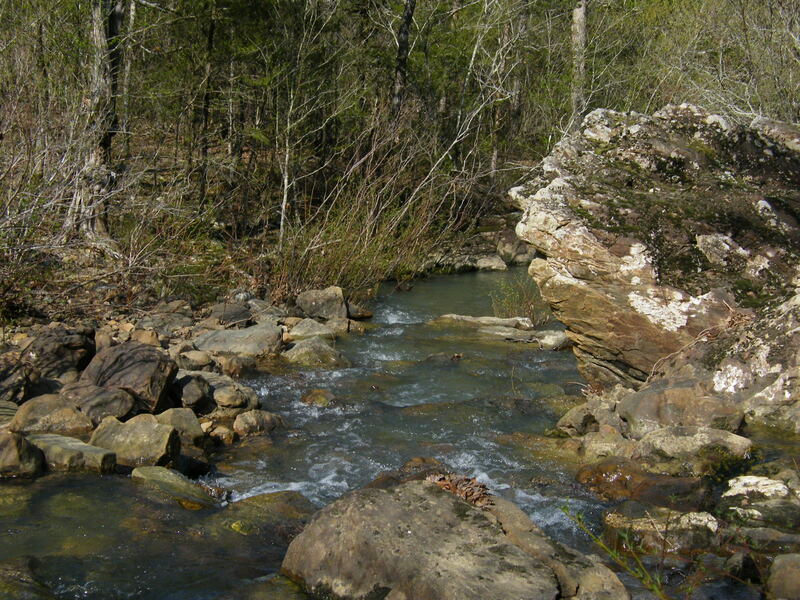 The put-in is at a small arch culvert bridge over the creek on the Autotour itself, 15.4 miles from Highway 7. 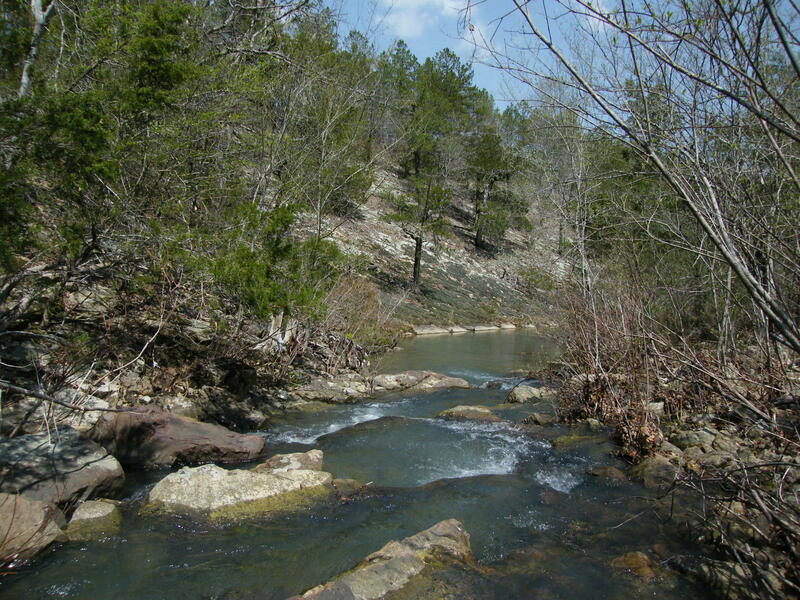 The Autotour route (a good gravel road) intersects Highway 7 at the top of the mountain, about one half mile north of the Ouachita Trail Hwy. 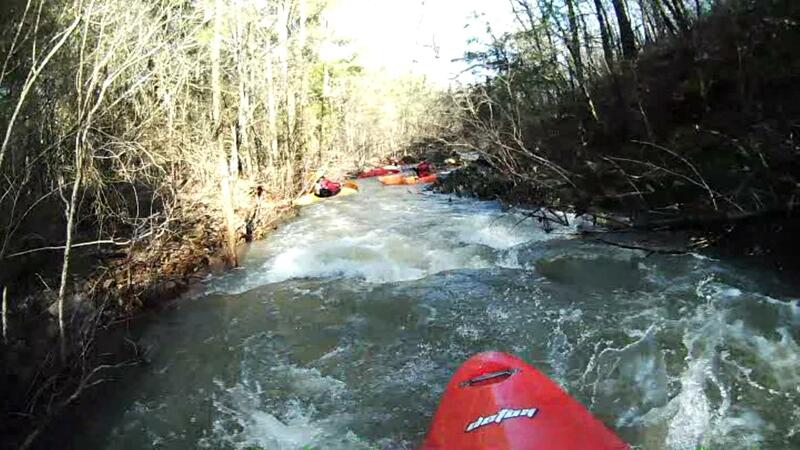 7 Trailhead parking lot (a good place to meet your paddling buddies), north of Jessieville. Head west on the Autotour. There are signs along the route at a lot of the many intersections to keep you on the Tour. At unmarked intersections stay on the main road and keep heading west. The take-out is a ford on Mt. Tabor road, a fairly rough road for much of its length. It should be passable by any vehicle with good ground clearance; all of the mudholes on the road have rock bottoms. The wheel ruts in the largest mudhole are deep enough to require that lower riding vehicles (ordinary cars) will need to place a wheel on the center hump and a wheel on the outside edge of the mudhole. Mt. Tabor road is not marked with its name, but there are a couple of Forest Service signs at the T intersection it makes with the Autotour that direct traffic coming off Mt. Tabor to Hwy. 7 to the east and Hwy. 27 to the west; it is 12.4 miles west of Hwy. 7 along the Autotour, 3 miles short of the put-in. 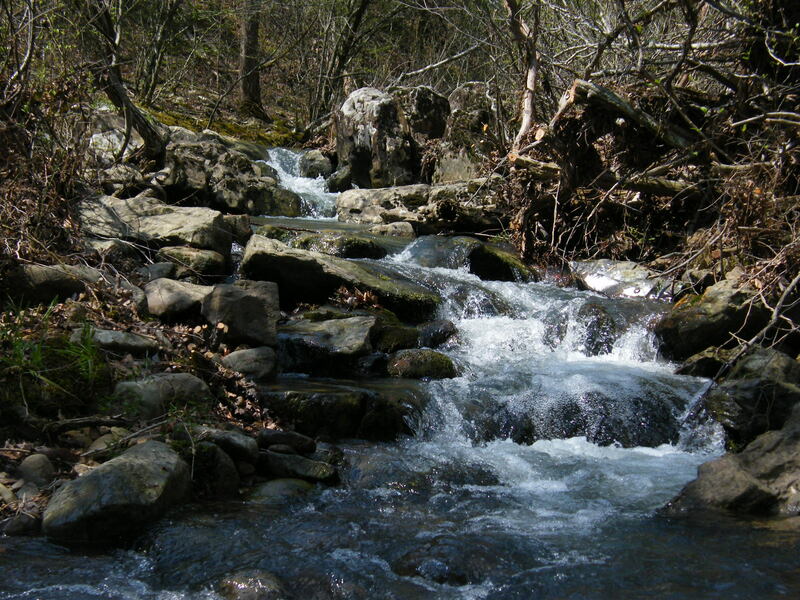 Little Creek is an unusual creek because the nature of the creek changes significantly as you progress down its 3.0 mile length. 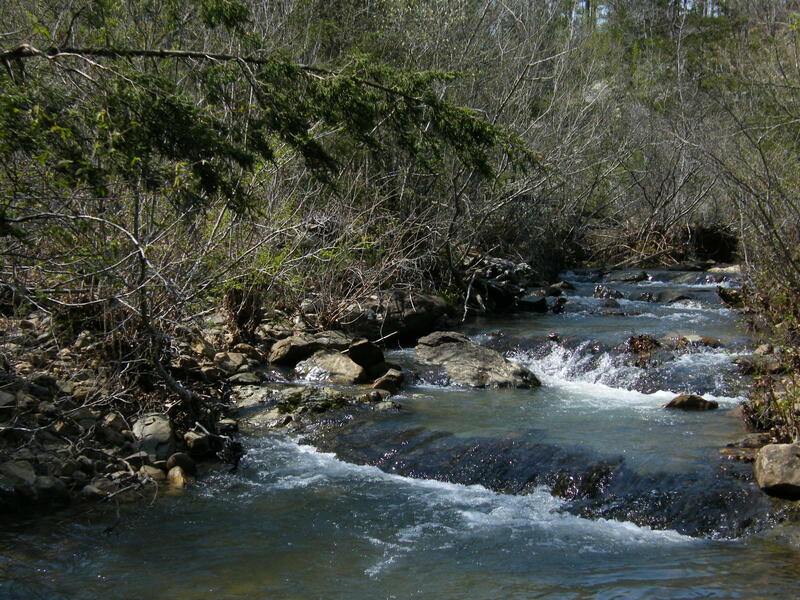 Starting from the Forest Service Autotour, the creek is a narrow, winding, rock and gravel bottom mountain stream with a well defined channel. 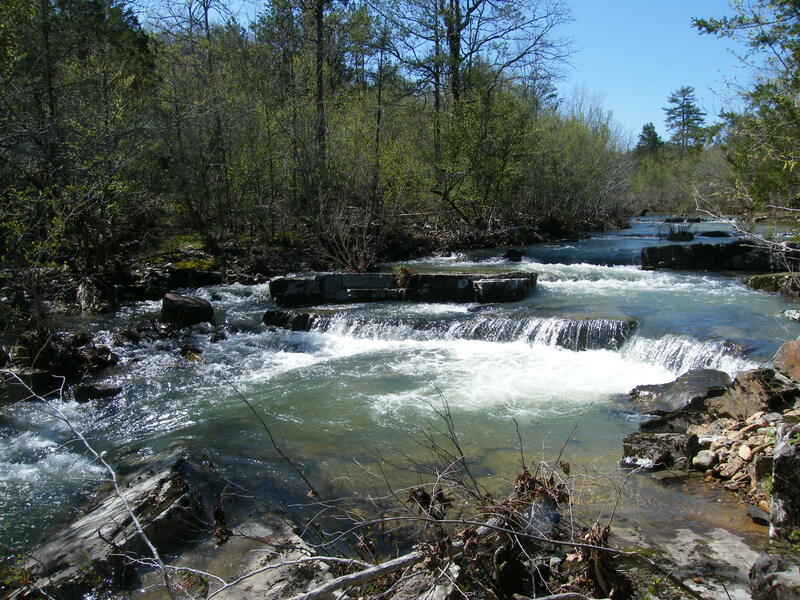 The first mile maintains this Class II, friendly nature that makes it suitable even for first time creek paddlers (whose skills include good directional control since the creek is narrow, winding, and fast paced). 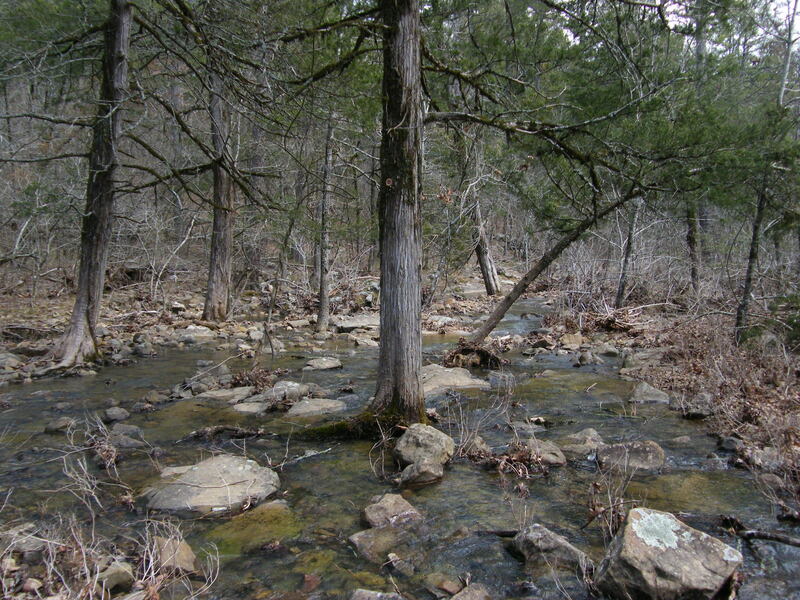 At the one mile mark there is a low water slab road crossing; it is possible to take out here. Four wheel drive may be required to get to this spot from the Autotour. The road down to the bridge is only a tenth of a mile long and is located one mile east of the put-in along the Autotour. 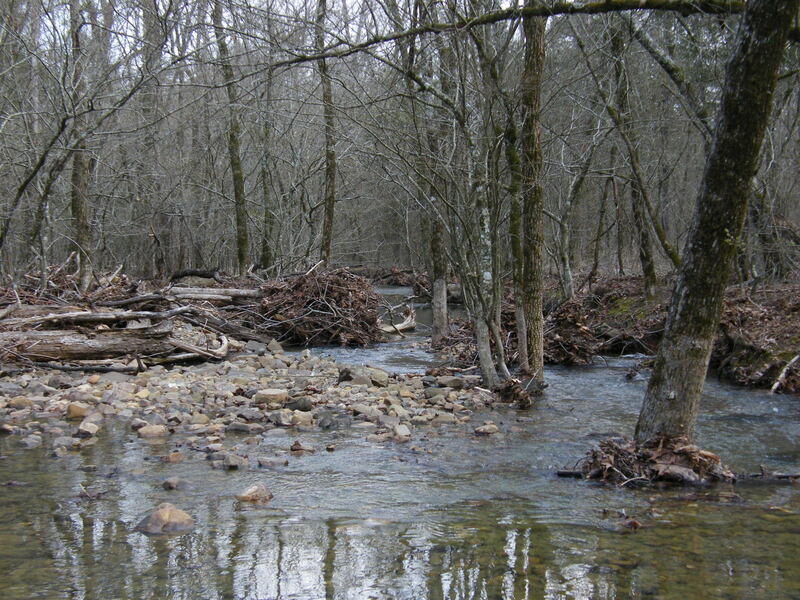 Shortly after the low water bridge, the gradient slows down and the creek spreads out over a wide area. The channel becomes very shallow and indistinct, branching and braiding through trees and underbrush. It appears to be in the process of changing course, moving to river right. 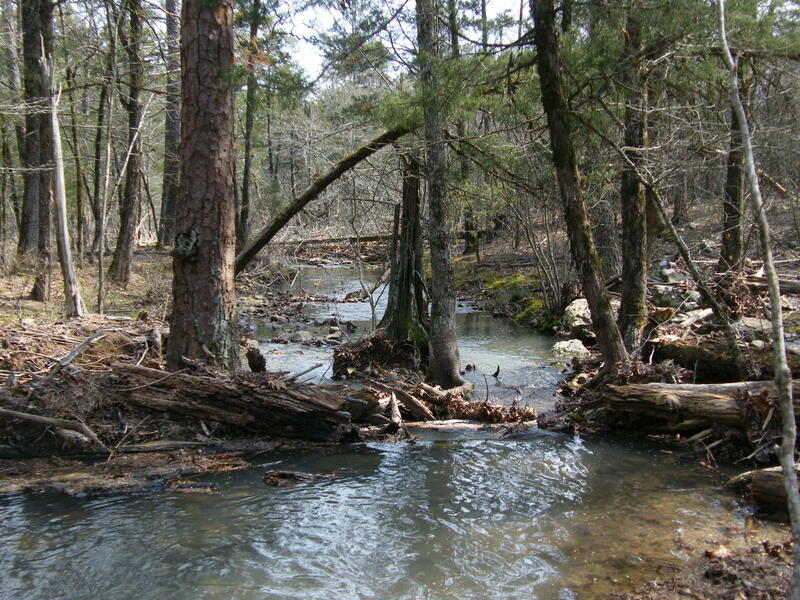 As it develops a new channel through sand and gravel, flow bleeds off to the old channel, far to the left through the woods. At times you can see the old course which seems to be about five feet lower than the new channel. Somehow Mother Nature has persuaded the water to try to run along the higher ground and stay right. Fortunately this transition zone is only about a quarter mile long. 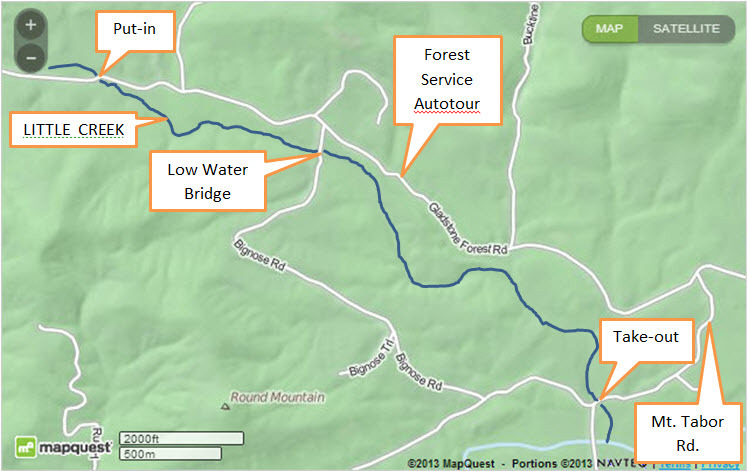 It will require quick maneuvering and focused planning ahead to avoid brush or log jams in this Class II+ section. The pictures below are from the best route through the mess. The falls are not vertical drop offs and you can choose from several routes for novelty. 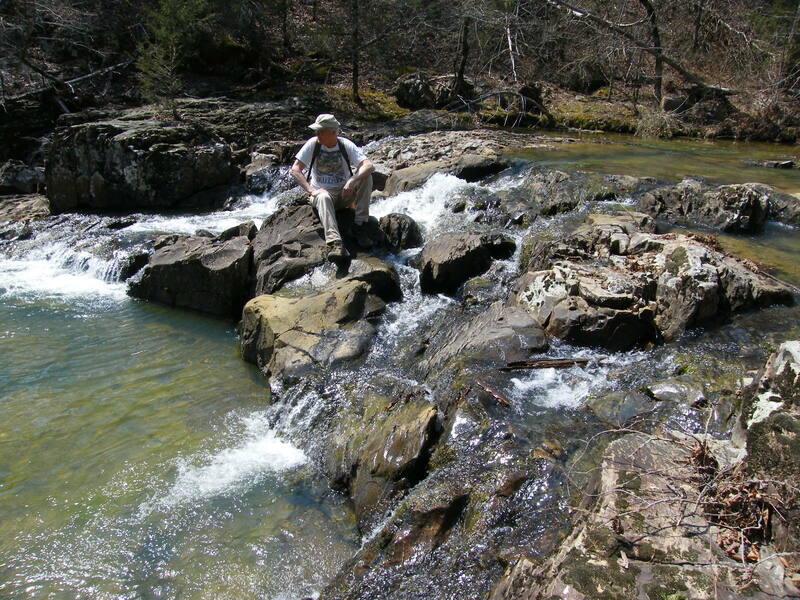 There are good sized pools below each fall. This fun section only lasts for a quarter mile, making up for the mess that preceded it. 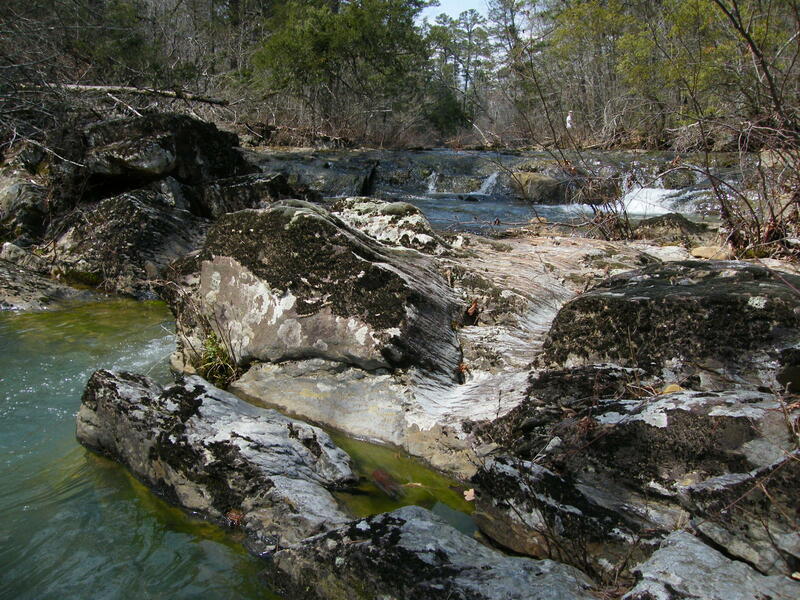 The creek becomes narrow again after the falls, but the channel contains bedrock outcrops that create lots of small falls for the next mile. 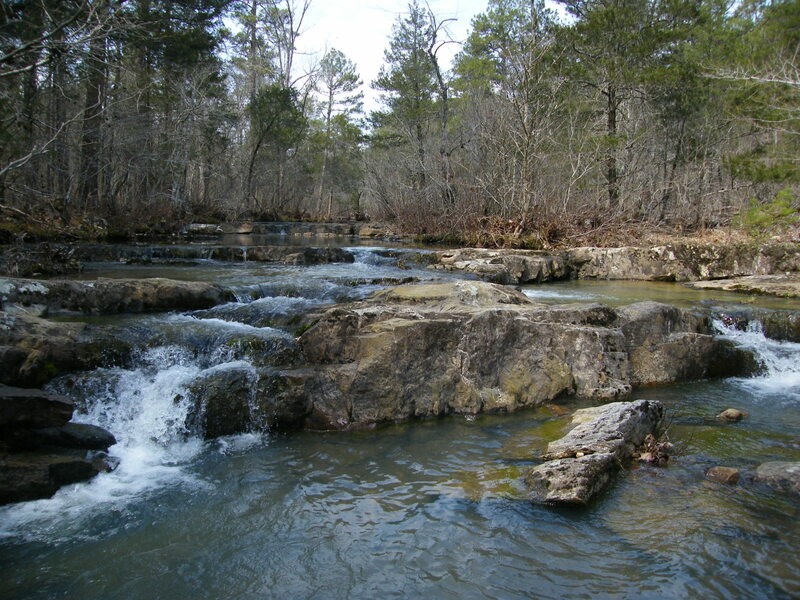 Cedar trees and brush grow out of some of the rock formations that create the falls, causing the need for careful scouting (from your boat) before committing to a line. Multiple routes may be possible, but some of them are definitely to be avoided. Some preferred routes are narrow and have sharp turns that will require constant maneuvering, elevating parts of this section to a Class II++ category. 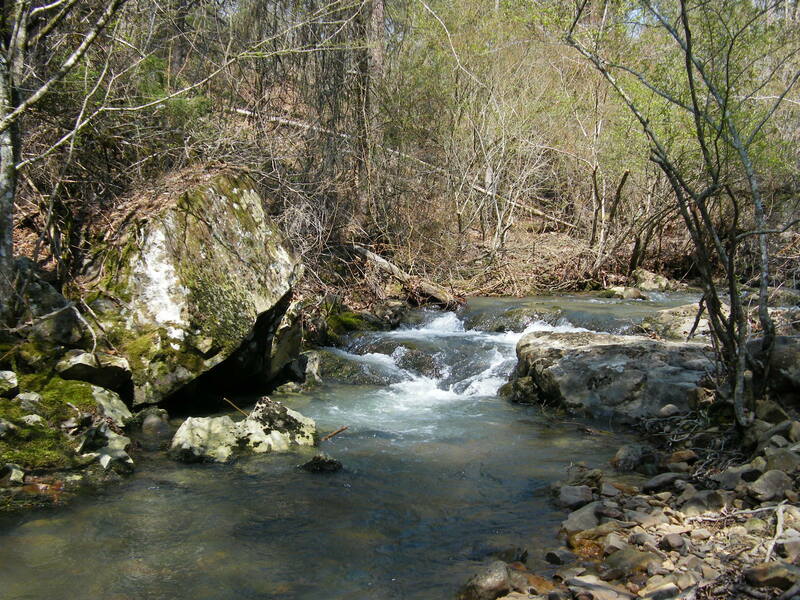 After this section, another branch of the creek feeds in and the channel becomes wide again due to the presence of solid bedrock. 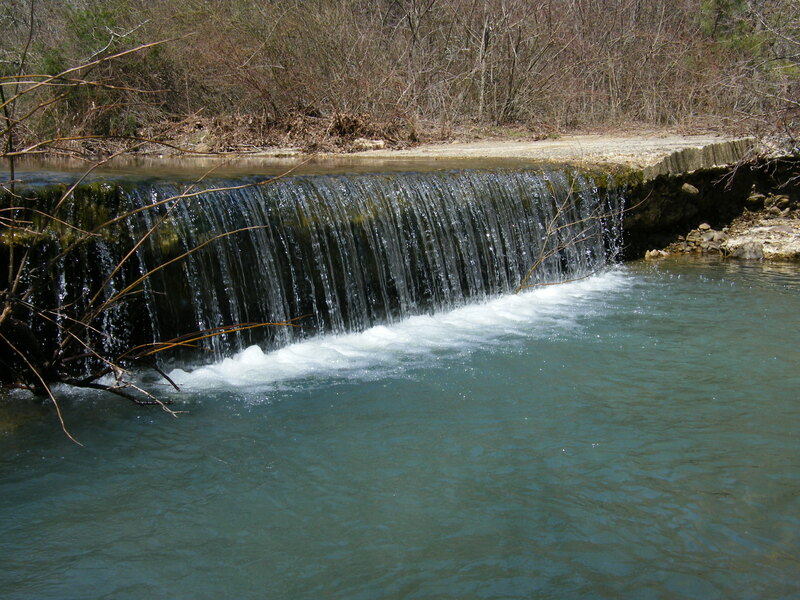 Several falls appear with the most entertaining one being a complex of drops with many routes. I call that one “Terri’s Falls”. There is a sneak route along the river-right bank for the weak of heart. 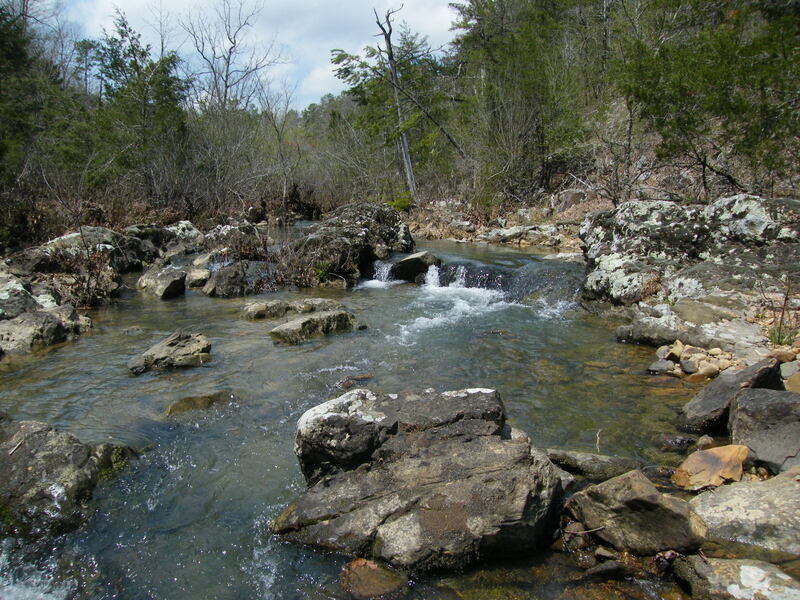 The bedrock and falls give way in the last mile to a winding mountain stream once again that is narrow in places, but otherwise has a fairly easy combination of pools and shoals. Put the brakes on when you arrive at the ford on Mt. Tabor road, your take-out. 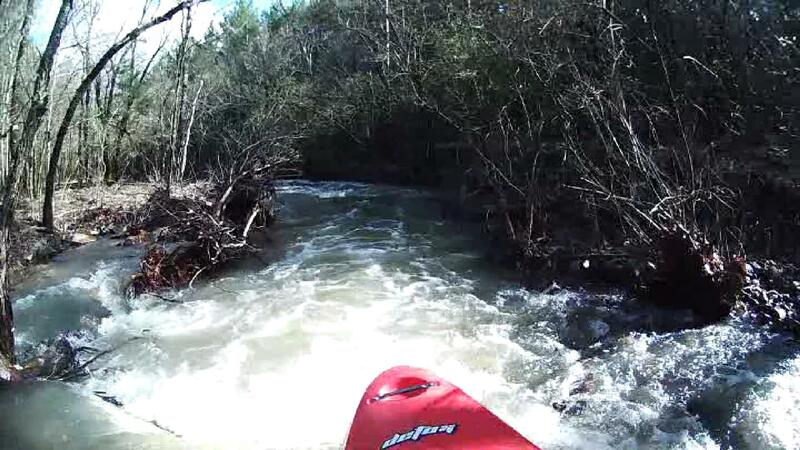 Below is a link to a video of the first mile of the creek. Rainfall on the night before the outing totaled 1.65″ and the ground was already wet before the rain fell. 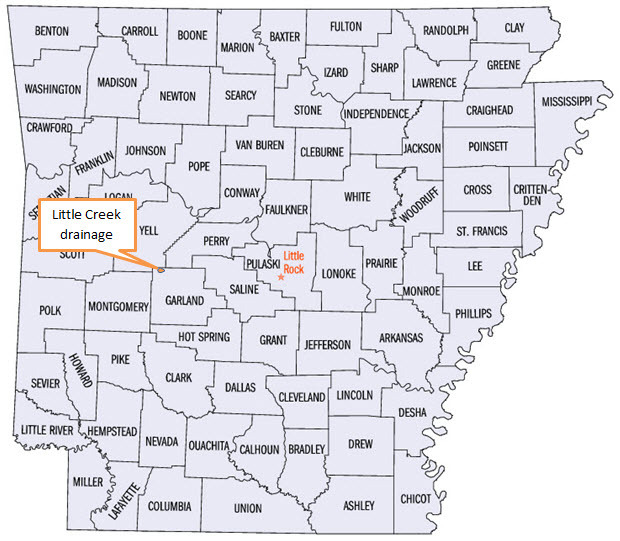 The map below shows the location of the drainage area for Little Creek.